Habit: Perennial herb. Stem: 2.5--8 dm, wiry; lower nodes knot-like. Leaf: ligule 1--2.5 mm, truncate, decurrent to sheath, toothed; blade 2--8 cm, 1--2 mm wide, flat to +- folded. Inflorescence: 4--15 cm, 6--15 cm wide, ovoid, open; branches thread-like, spreading. Spikelet: glumes 2--3 mm, acuminate, occasionally short-awned, awn < 1 mm; lemma 3--4.2 mm, hairy below middle, awn 2--10 mm; anther 1.5--2.3 mm, purple to yellow. Chromosomes: 2n=20,23,24,40. 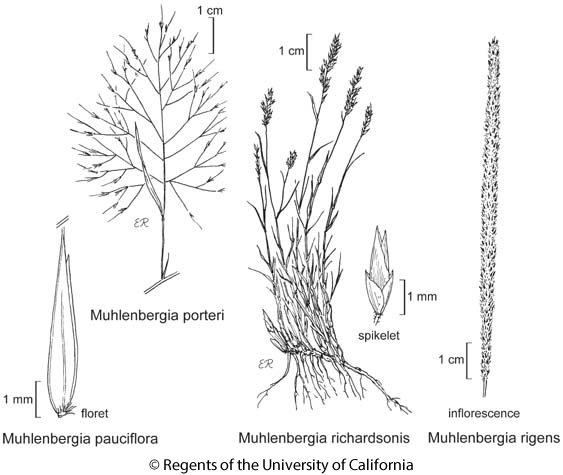 Citation for this treatment: Paul M. Peterson 2012, Muhlenbergia porteri, in Jepson Flora Project (eds.) Jepson eFlora, http://ucjeps.berkeley.edu/eflora/eflora_display.php?tid=34110, accessed on April 22, 2019.